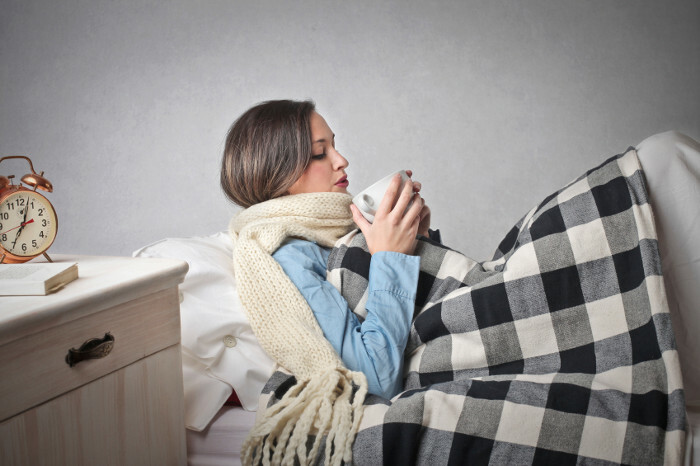 When cold season hits, it’s easy to reach for an over-the-counter cold medication that promises immediate relief, but did you know that many types of medications are actually made from the chemical compounds found naturally in herbal teas? The next time you’re faced with a cold, try one of these delicious and healthy teas for a natural cure. Commonly used in traditional medicine, chamomile tea has long been a favorite among naturalists and is becoming more widely recognized by mainstream medicine for common ailments. The benefits of chamomile are immense, but the herb is actually recognized by the Journal of Agricultural and Food Chemistry , as being a remedy for the common cold (and menstrual cramps). A small study showed that participants who drank chamomile tea had a much higher level of hippurate, which is linked to antibacterial activity. Researchers believe that the increase in hippurate is responsible for chamomile’s ability to fight infection. With a beautifully light flavor, chamomile can be complemented with a lemon wedge for an extra citrus boost when you have a cold. Hibiscus tea is a very commonly consumed in Chinese, Thai and Indian culture, known for its many health benefits. Of the many uses for this tasty jewel-toned tea, treating the common cold is one of the most common. While scientific evidence to support this use is somewhat lacking, hibiscus tea has been used for thousands of years, reportedly favored by pharaohs and royalty. Rich in vitamin C, antioxidants and flavonoids, hibiscus tea can help you get over your cold faster. Try adding a little organic honey and cinnamon to your tea, both of which have anti-bacterial and anti-inflammatory properties. Saffron, a commonly consumed tea for colds, whooping cough, asthma and general coughing, is also an expectorant. This is especially helpful for colds that cause a lot of phlegm. However, when using medicinal amounts of saffron, it is best to proceed with caution, as some people can have an allergic reaction or experience issues such as dizziness, anxiety, nausea and headaches. Typically, saffron is not used in large amounts for more than six weeks, as high doses can cause poisoning and amounts of 12-20 grams can result in death. A classic herb, sage is used to make some types of medicine and is currently being investigated for use in the treatment of serious disease like cancer and Alzheimer’s. While further research is needed for these uses, sage tea has been used for centuries as a powerful weapon against colds, bronchitis and cough. Sage contains camphor and is a diaphoretic, astringent and expectorant. Drinking sage tea when you have a cold can help increase sweating and loosen up congestion causing phlegm, leading to a faster recovery. Most people have at least heard about the wonders of Echinacea when it comes to fighting the common cold. Not only is Echinacea tea one of the best year round additions to your diet, this amazing little herb actually builds up your immune system by promoting the production of more white blood cells. It also fights microbes directly when used as a gargle. Echinacea is really pretty potent stuff, having been shown to kill the influenza virus in test tube studies. Many people drink Echinacea during cold and flu season combined with a garlic regime, as test tube studies show that garlic is very effective at killing or severely inhibiting the viruses that cause the cold and flu. With such a wonderful array of herbal remedies at your fingertips, kicking the common cold has never been so easy or delicious.